Providing specialised early intervention programs and children’s therapy, to support children and families. At Yooralla we provide specialist therapies and interventions for children with developmental delay or disability, recognising the importance of early intervention in building a child’s functional capacity. Our team of therapists includes qualified physiotherapists, speech therapists / pathologists and psychologists, and can work with your child through the early years, and later through school and beyond. Our therapy team can support your family by providing tailored assistance, resources and information. Emmy has been supported by Yooralla’s specialist children’s therapy services to achieve her goals of going to kindergarten and school. Watch this video to learn about Emmy’s journey. Yooralla’s Specialist Children’s Supports take a family-centred approach to supporting your child. This means a team of therapy specialists will work together with your family to deliver individually tailored early intervention services to your child. For children not yet at school, this may be through a transdisciplinary model, where a key worker assists to coordinate the delivery of services, manages links between all members of the transdisciplinary team (for example a psychologist and speech therapist), and ensures a smooth delivery of services. School-aged children are usually supported through a multidisciplinary approach. This means a children’s therapy team, for example a physiotherapist, occupational therapist and psychologist work together to support your child. positive behaviour support, to develop strategies that build on the child’s strengths and are based on developing positive relationships, communication and coping skills. respite supports specifically for children. Yooralla is a children’s disability specialist. 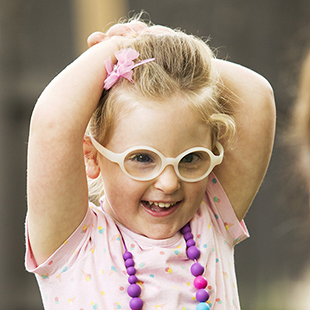 We provide high quality, evidence-based, best practice National Disability Insurance Scheme (NDIS) children’s therapy. Our qualified, transdisciplinary therapy team consists of physiotherapists, speech therapists, psychologists and occupational therapists. Our services are family-centred. Our strategies are tailored to your child’s own individual needs and are focused on building their independence and inclusion within your home and community. We are a not-for-profit organisation that has been supporting children with developmental delay and disability since 1918. We are one of Victoria’s oldest and largest disability services providers. 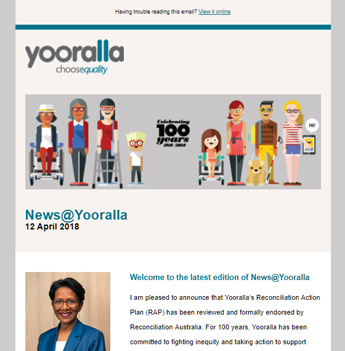 Yooralla is a registered NDIS provider. You can ask for an Easy English Factsheet. Click on Easy English Summary. For more information about Yooralla’s Specialist Children’s Supports, please contact us. Participate in any recreational pursuits you enjoy, individually or in a group. Anything is achievable.